Sonar's EQ capabilities take a huge step forward with X1's ProChannel. Some of the biggest X1 buzz revolves around the ProChannel, a channel strip with six bands of EQ, two types of compression (modelled on the UREI 1176 and SSL 4000G) and two types of saturation. In this article we'll cover the EQ section. ProChannel's EQ replaces the aging Sonitus EQ that used to be built in to every channel (as is ProChannel) and the improvement in overall sound quality and functionality is substantial. Opening a pre‑X1 project that has the Sonitus EQ in a channel locks out the ProChannel EQ for that channel. You'll know it's locked out because you won't be able to adjust any of the EQ controls, although the dynamics, saturation and routing sections will still be accessible. Interestingly, you can make adjustments on the ProChannel EQ plot itself (as described later), but this edits the Sonitus EQ's response, not the ProChannel's. As a result, if a channel does include the Sonitus EQ, you can adjust the response from the ProChannel without having to open up the Sonitus EQ. If you prefer to adjust the Sonitus plug‑in instead, no problem. Access the Sonitus EQ by double‑clicking on the console channel strip EQ plot (not the ProChannel EQ plot), and the Sonitus EQ opens up. Ctrl‑click on the EQ enable button on the ProChannel itself (to the upper right of the EQ plot). The graph will immediately flatline, to indicate that the Sonitus settings have been discarded. Click on the ProChannel EQ enable button again to turn it on. 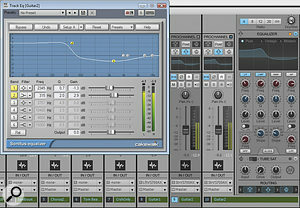 You can now use the ProChannel EQ. If you want to transfer the Sonitus settings to the ProChannel, you'll need to do that manually. Here's the easiest way I've found. You can substitute the ProChannel EQ for the Sonitus EQ in pre‑X1 projects, but you'll need to transfer parameter values manually. Here a track has been cloned, and the ProChannel EQ settings are being adjusted to match those of the original Sonitus EQ.1. Make sure the track whose Sonitus settings you want to transfer is enabled in Track View. 2. In the Track View Tracks tab, select Clone Track(s) or select Clone Track in the context menu that appears when you right‑click on the track in Track View. 3. Tick Clone Events, Clone Properties, Clone Effects, and Clone Sends: we want the cloned track to be an exact duplicate, as we'll eventually delete the original track. 4. 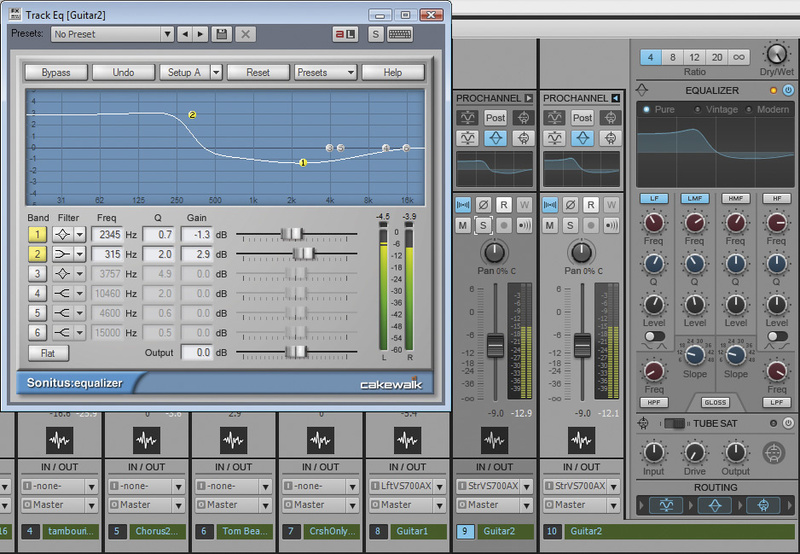 Double‑click on the original track's EQ plot to open the Sonitus EQ. 5. Show the cloned track's ProChannel and Ctrl‑click on the EQ enable button. 6. 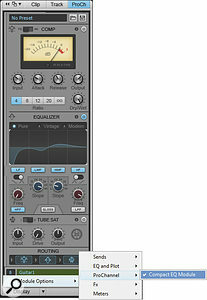 Adjust the ProChannel settings to mimic those of the Sonitus EQ. 7. 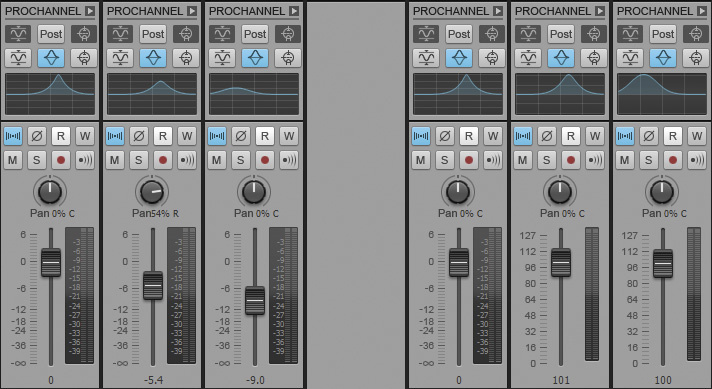 Compare both channels to make sure the EQ settings have translated properly. If you really want to be a fanatic about this, throw one of the two channels out of phase and solo them both. Then tweak the ProChannel controls (as described in the next section) until you get the best cancellation. 8. If all is well, delete the original track, keep the cloned track and save the project. 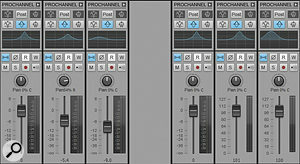 In step seven above, you might wonder which EQ 'character' to use: Pure, Vintage or Modern. Actually, it's very instructive to compare these, and a good way is to match levels on the ProChannel with the Sonitus channel (before you delete it! ), then throw one of them out of phase. For the highest resolution when trying for cancellation, hold down the Shift key while adjusting the ProChannel knobs. You will not be able to cancel the sounds totally, so you'll hear a difference between the two. For a response that's closest to the Sonitus (ie. maximum cancellation), I'd choose Modern, as this seems to be the most 'accurate' response. Pure, to my ears, is the next closest but, even if you match them really closely, you'll note that the ProChannel gives a richer low end and smoother highs. So it looks as though Cakewalk intended this option to be a more 'musical' EQ, rather than being one for 'surgical precision'. The Vintage option seems to model control interaction, gives a fatter sound in the low end, and has an interesting mid‑range response. However, according to Cakewalk, they weren't trying to model any specific piece of gear, but instead achieve a particular character. Don't ignore what the high-pass and low-pass filters can do for your sound. Remember that they can also be switched to a shelving response and that, in some situations, they can work well in conjunction with the 'Gloss' filter option. A common high‑pass filter technique is to set the frequency below the lowest energy in a track. This tightens up the low end by minimising hum, room rumble, subsonics and handling noise (with mics), for example. What's exciting with ProChannel is the ability to choose a really steep, 48dB/octave roll off; adding a steep low cut may not make too obvious a difference with individual tracks, but the effect is cumulative and opens up more space for bass, kick drum and other low‑frequency instruments (taiko fans, take note!). I often use a low‑pass filter on tracks as well, because reducing the very highest frequencies can minimise 'brittleness' and create a warmer sound. I've noticed this particularly with some sampled instruments that seemed like they were recorded bright so that they'd jump out and have a 'hyped' sound. Reducing highs can make these sit much better in a mix. ProChannel has a Display tab that lets you access Module Options. 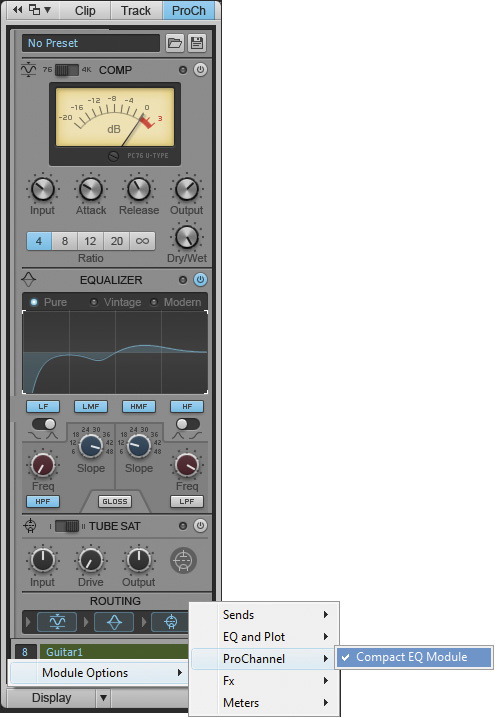 Two of these are important for EQ: Choosing Compact EQ Module shrinks the amount of space required by the EQ, but you can still adjust all EQ parameters graphically by clicking and dragging in the EQ plot. Display / Module Options / ProChannel / Compact EQ Module: This shrinks the EQ size so that you see only enable buttons for the bands, along with the full high‑pass, low‑pass and Gloss options. You may need to use the compact option if your monitor's vertical resolution is less than 1024 pixels (the minimum I've found that lets you see the full ProChannel) or if you're using a laptop and need more screen space. However, note that this doesn't lock you out of making EQ adjustments, as you can make all needed adjustments on the plot itself. The only aspect you're missing is the numeric calibrations, but some would say this is a good thing, forcing you to use your ears! Note that the plot is divided into four rectangles, each one representing one of the four EQ bands. Clicking within the band turns that band on or off (this is the same as clicking on the label with the band name abbreviation, for example LMF or HF). Hovering within a band shows two ticks on the graph's top and bottom that indicate the band filter's frequency setting, and two horizontal ticks that indicate boost or cut. Note that the frequency ticks can appear outside of the rectangle if the frequency is out of the range indicated by that rectangle. If you click and drag within a rectangle, dragging horizontally adjusts the frequency, while dragging vertically determines the amount of boost or cut. If you hold down Alt while dragging vertically, you edit the Q instead. You don't have to lift your finger off the mouse button to switch between editing Q and boost/cut. The three mixer channels on the left have plot resolution set to 18dB; you can clearly see the difference in amplitude among the three peaks (from left to right, +18, +12 and +6dB). The three mixer channels to the right have plot resolution set to Auto, making it impossible to see the level differences among peaks at a glance. Display / Module Options / EQ and Plot: This offers a choice of EQ-plot resolutions, which is a global setting for all channels. I recommend not choosing Auto, because if a peak or notch exceeds 6dB, the plot will be re‑scaled to fit within the existing graph. As a result, if one channel is set for a peak of +18dB and another for +6dB, they will look like they have the same amplitude, but the +18 peak will appear to have a higher Q.
I prefer the 6dB option because it gives the most detail to the graph, but more importantly, if you need drastic EQs that 6dB won't show adequately, that's a hint that maybe there's a problem with your recording or mixing techniques. Unless you're doing something surgical, like notching out hum, you really shouldn't need radical amounts of EQ.